Homeopathic remedies will treat a person with symptoms of mastoiditis without the use of antibiotics. Mastoiditis can be acute, chronic or recurrent. Mastoiditis is an inflammation of the mastoid process which is the bone behind the ear. This bone is part of the temporal bone of the skull that is behind the ear. Mastoid process contains open, air-containing spaces. Mastoiditis can be acute, chronic or recurrent. Mastoiditis may be the result of blockage of ear drainage. The perforation of tympanic membrane may also lead to mastoiditis. Mastoiditis is usually caused by the infection of the middle ear (otitis media). Infection from middle ear then spreads to the air cells of the mastoid process. Mastoiditis is caused by certain gram-positive bacteria such as streptococci pyrogenes, staphylococcus aureus, etc. Discharge of pus or fluid discharge from the ear. A physical examination, CT scan, MRI and X-ray will help to confirm the diagnosis and evaluate the extent of disease. Caries of ossicula and mastoid. Chronically draining ear, mainly right ear. Thick and yellowish discharge which shows no tendency to heal. Burning and stinging in ear. Tenderness over the petrous bone, extremely sore and tender to touch. Otorrhea and mastoid disease before suppuration. Chronic otitis and external otitis, often together. Left-sided otitis nearly always draining. Chronic discharge from the ear, often thick, gluey and offensive. Hearing better in a noisy environment. Chronic complaints after suppressed ear discharge. Scurfs on and behind the ears. Whizzing and throbbing in the ear, with hardness of hearing. Pustules in the auditory canal and auricle, mastoiditis. Ear: Crackling and popping in the ears on swallowing or movement of jaw. Deep catarrhal conditions with sinusitis, bronchitis and otitis or "glue ear." Ear: Hearing loss from chronic serous otitis. Catarrh with chronic yellow discharge. Uncomfortable and irritated in a warm room, while the local symptoms of obstruction and mucus may improve. Mouth breathing and snoring. Irritable yet timid with those outside the family. Acute and recurrent otitis media with marked suppuration. Clear rhinitis ("cold") followed by thick discharge, then earache. Ear: More often affecting the right ear. Pain, discharge, hearing loss. Yellow-green offensive discharge from ear with difficulty hearing. Inflammation of external ear canal. Worse: Night. Damp weather. Heat of the bed. Swallowing. Better: Cold application. Local: Sore throat with acute otitis. Tongue with dirty coating and tooth imprints. General: Patient is sweaty, has excess saliva and a "sick" odor (especially the breath). Often with serious conditions: Sinusitis, bronchitis or pneumonia. Similar to Mercurius solubulis except used in cases which which are right sided. Similar to Mercurius solubulis except used in cases which are more left sided and "flavus" is used in cases which are right sided. Chronic pain and inflammation in the right ear. Ear pains extending upward from the throat on swallowing. Severe pain; stitching ear pains. Ears cracking when person chews. Better: Warm applications. Disposition: Irritable and demanding. Itching and catarrh deep in the eustachian tubes. 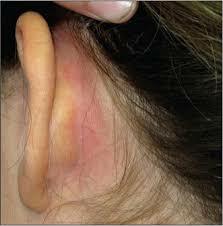 Chronic and purulent discharge from ear. Progressive hearing loss from serous otitis. Stitching pains in ears when swallowing. Chilly. Worse all winter long. Sensitive to noise, roaring in ears.